A few weeks ago it had rained a bit and, as I sketched a Banana slug (Ariolimax columbianus) devouring the leaves of a Wild cucumber (Marah oreganus) plant, this little fellow ambled across the rock I was sitting on and buried itself in debris that had built up in a crevice in the rock. It was gone before I had a chance to sketch it but I lucked out the next day when I saw a white mushroom glowing in a patch of Poison oak (Toxicodendron diversilobum) and went closer to inspect it. Not only did I find fungi but I found two of these little slugs having a feast. 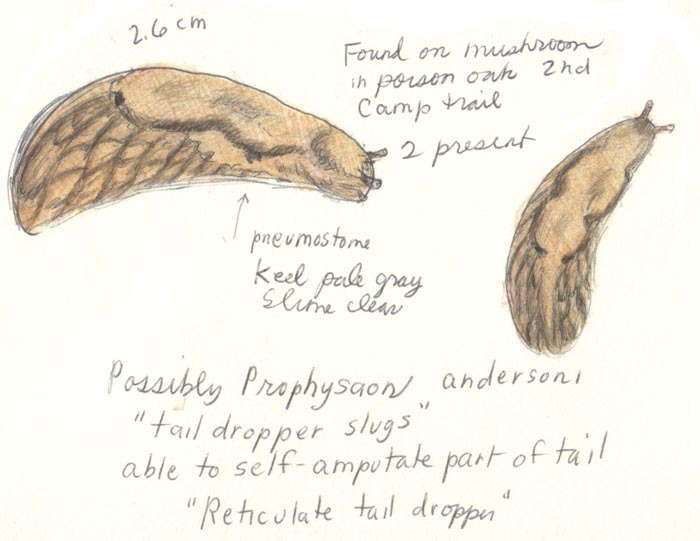 I was able to pick up the mushroom and take it out of the Poison oak and sketch one of the slugs while it ate, then return the mushroom to it's original location with the slugs still attached. Though slugs don't actually have tails this native species is called Reticulate tail dropper (Prophysaon andersoni) because they're able to self-amputate the back end of their bodies much in the same way that lizards release their tails when captured. lovely sketch and informative post. Not many people take the time to enjoy the "lesser" forms of nature out there. They are worthy of the post and drawings!